By default, calls are terminated if no agents answer within 30 seconds. Enabling this option will skip directly to the specified no answer routing behavior instead of waiting for the “seconds to answer” time to expire. By default, the caller will wait for the full “seconds to answer” time before being following the no answer routing. 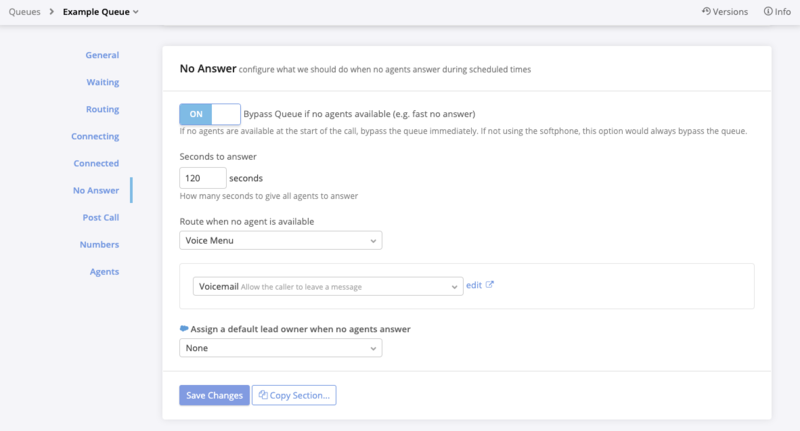 “Seconds to answer” determines the total amount of time that a queue will wait for an agent to answer a call. When this time is expired, the caller will be sent to the no answer routing that has been configured for the queue. By default, unanswered calls will simply hang up. If the Salesforce integration is enabled for your account, you can use this option to select an agent who will be assigned as the lead owner if a queue call is unanswered. By default, no agent is assigned for unanswered calls.